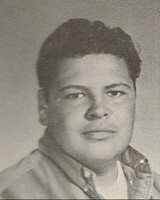 Edmond died in a car accident in 1969. To my Big Brother! You are still loved, and thought of often. See you again on the other side.xoxo your sister Stormy........ ! God must have really loved you, he took you home so early. Have fun in paradise,see u when i see u.
Edmond was a great friend however it was only for a few years. There was a group of us that went all over the place together. We fished, hunted, water skied and went to Fremont Drag races almost very Friday night. My brother Terry was in the car with him that day and I got there a few minutes after the crash and sad to say by the time I found him he was not alive. it was a changing time for all of us that day, very sad we missed him very much he was a big part of our everyday life. If you knew Ed take a minute and post a littel something. Edmond was a very close friend of my brother, David Pascal. Edmond hung out at our house alot. He was very funny and a good person. He was taken away from us all to soon.